Chinese President Hu Jintao held talks with Japanese Prime Minister Naoto Kan on the sidelines of the 18th Economic Leaders' Meeting of the Asia-Pacific Economic Cooperation (APEC) forum in Yokohama, Japan on Saturday. Hu stressed that it is a right choice in the interests of both peoples for China and Japan to follow a road of peace, friendship and cooperation. The two sides should proceed from a strategic and long-term perspective, abide by the principles defined in the four political documents between the two countries and firmly maintain the right direction of developing bilateral relations in order to advance China-Japan strategic and mutually beneficial relations on a healthy and stable track, Hu said. The Chinese president pointed out that China and Japan should make joint efforts to consistently conduct cultural exchanges to boost mutual understanding and friendly feelings between the two nations. China and Japan, being each other's main trading partner, should continue to deepen their bilateral mutual beneficial cooperation and enhance dialogue and coordination on international affairs in a bid to jointly contribute to Asia's revitalization and address global challenges, Hu said. 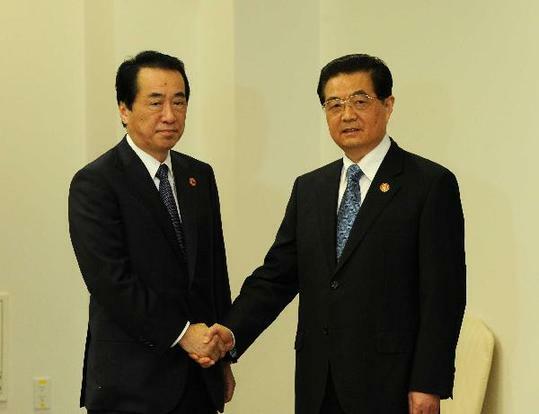 Kan said he was in full agreement with Hu's opinions on developing China-Japan relations. He said he hoped that the two sides would strengthen communications and cooperation in various fields and further improve and develop bilateral relations. The Japanese prime minister also congratulated China for its success in hosting the 2010 Shanghai World Expo. The two-day 18th Economic Leaders' Meeting of the APEC forum opened here Saturday afternoon, with the theme of "Change and Action."